At the beginning of February, some 50 members of the Fayette County Retired Teachers Association met for their first meeting of 2017. The program was presented by John Buch, Member-Education Coordinator of Ohio’s State Teachers Retirement System. He began by reading several thought-provoking facts: Ohio’s oldest retired teacher receiving benefits is 106 years old , but there were in total 171 retirees over the age of 100 to whom STRS paid benefits in 2016. He then provided a concise list of contact numbers for entities that retired educators might need to contact, such as STRS Ohio, Medicare, Social Security, and the prescription medications provider, dental plan and the two health plans into which Ohio’s retired teachers are placed. He also alerted the local group to some of the upcoming changes that may have to be made by the STRS Board as the result of a recent meeting focused on new—mostly ominous—actuarial assumptions. Shown are John Buch from STRS and President Susan Stuckey from the FCRTA. 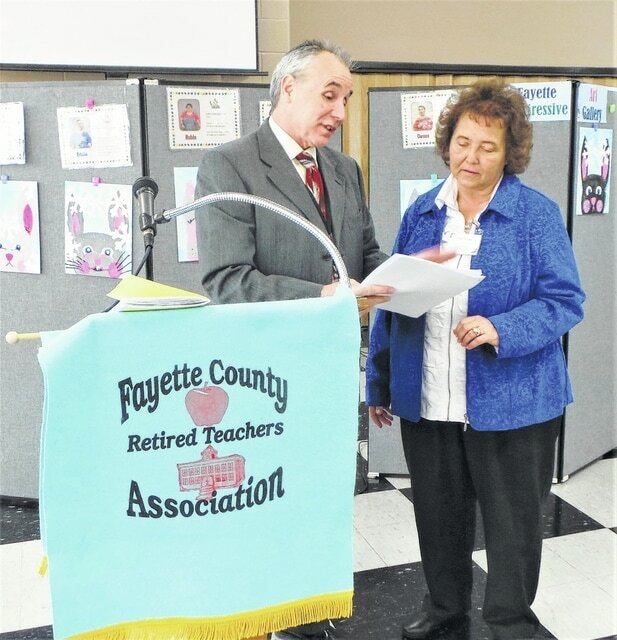 https://www.recordherald.com/wp-content/uploads/sites/27/2017/02/web1_20170202_114239.jpgAt the beginning of February, some 50 members of the Fayette County Retired Teachers Association met for their first meeting of 2017. The program was presented by John Buch, Member-Education Coordinator of Ohio’s State Teachers Retirement System. He began by reading several thought-provoking facts: Ohio’s oldest retired teacher receiving benefits is 106 years old , but there were in total 171 retirees over the age of 100 to whom STRS paid benefits in 2016. He then provided a concise list of contact numbers for entities that retired educators might need to contact, such as STRS Ohio, Medicare, Social Security, and the prescription medications provider, dental plan and the two health plans into which Ohio’s retired teachers are placed. He also alerted the local group to some of the upcoming changes that may have to be made by the STRS Board as the result of a recent meeting focused on new—mostly ominous—actuarial assumptions. Shown are John Buch from STRS and President Susan Stuckey from the FCRTA.